After joining the Dynamo Academy in 2010, Lucatero was a standout at every level of youth competition. The Pasadena native trained with the U-18 national teams of both the United States and Mexico. But with RGV FC, his opportunities have been more fleeting. Last season, he played 271 minutes across 18 matches, and this year Lucatero has been on the pitch for 427 minutes across 12 matches. The 20-year-old ranks 20th on the team in minutes played. Lately, Lucatero has been starting to take on a larger role. He played 45 minutes on Aug. 30 against Portland Timbers 2, then started and played the full 90 for the first time this season on Sunday in a 1-0 loss to LA Galaxy II. 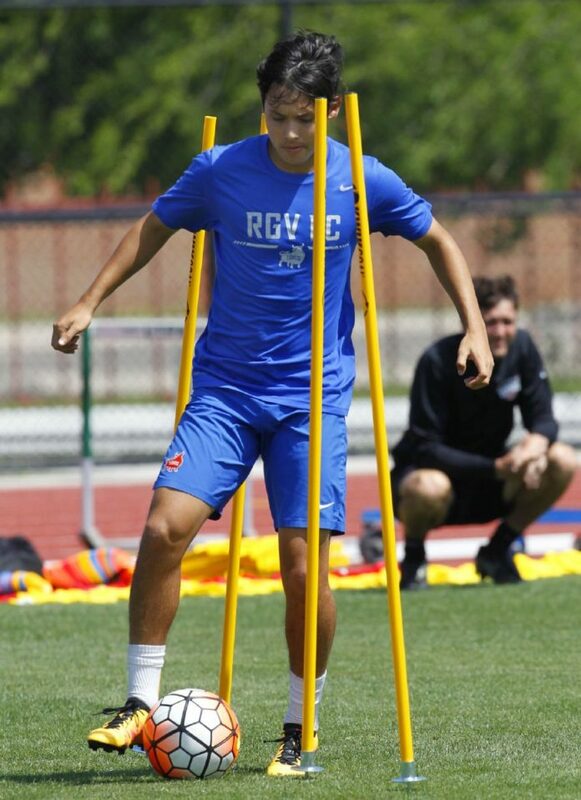 Toros coach Junior Gonzalez said Lucatero has been filling a similar function to the one Charlie Ward held in the midfield before he was called up to the Dynamo in June. As RGV FC prepares to face Sacramento Republic FC at 7:30 tonight at H-E-B Park in Edinburg, Lucatero is again expected to take on a prominent role. Gonzalez said Lucatero’s increased role has been due in part to injuries, as midfielders Emilio Garcia and Jorginho James have been limited in recent weeks. The vacancies allowed Lucatero to slide into a central midfield position, which he feels is more natural for his skillset. For much of the past two seasons, the Toros had used him mostly on the wing. “I just want to get that starting spot as the No. 10 and help the team get wins and contribute to the team more,” Lucatero said. Gonzalez pointed to Lucatero’s defensive improvement as the biggest reason he’s earned more playing time. Still the youngest player on the Dynamo roster, Lucatero knows his growth on the back end will be critical to his development. He said he copes with a lack of playing time by talking about it with his parents, teammates and coaches, adding that regular contact with the coaching staff helps him refine his focuses in practice to earn game opportunities. He said he’s also still maturing personally, learning how to handle life on his own. Even among the Toros, Lucatero ranks as one of the youngest players. Last season, Lucatero said he found teammate Memo Rodriguez to be very helpful in that regard. With Rodriguez now up with the Dynamo, Lucatero said his closest friend on the team is defender Leo Ayala. Forward Ruben Luna said he’s also tried to lend his support to Lucatero, telling him that the 45 minutes he played against Portland on Aug. 30 were his best yet. And when Lucatero was struggling to find playing time, Luna told him to keep his head up.